There is this site which shows an enhanced version of the Nix film. At about the 32 second mark you will see a small white spot appear, grow and vanish. Is it a puff off gunsmoke? Since this area is an enhanced section of an 8mm film it's a little distorted, especially if you don't know the area of Dealey Plaza. 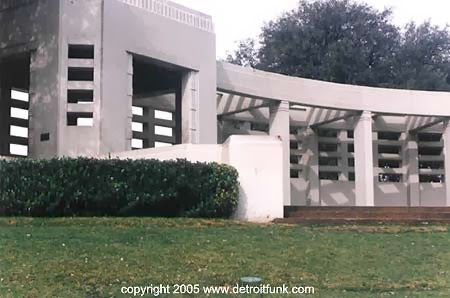 The white flash appears inside a semi-enclosed area of this curved marble structure on top of the north grassy knoll. These white structures were built as part of a Works Progress Administration. This area is seen below. It has three ways to enter or leave it. One is at the top of some stairs on the knoll and then it levels a bit. 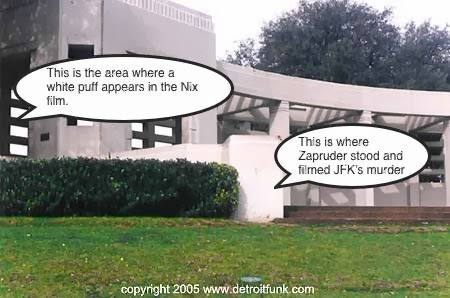 This is the area of this structure that the white puff appears in the Nix film. Then there is an entranceway almost directly behind Zapruder, and one follows the curve to another such structure. This photo's predominate feature is the white post that Zapruder stood on.